Eilbeck successfully defended his North West regional 54-57kg belt in style on Saturday, stopping challenger Kiernan Macfee at Barrow Amateur Boxing Club’s charity bout and auction night. The Barrow ABC ace had his Castle Hill ABC opponent in trouble inside the first minute, thrilling the sell-out crowd at the marquee dinner in the grounds of Abbey House Hotel. An assault of punishing left-handers from Eilbeck resulted in referee Wayne Heywood giving Macfee a standing count. The plucky challenger then survived a second standing count before rallying to catch Eilbeck with a good right-hand. But for the most part it was one-way traffic, with another Eilbeck battering leading to the contest being stopped in the second round, as the Brook Street fighter retained his belt and also lifted the Peter Skyrme Memorial Trophy, awarded to best boxer on the night. Eilbeck was not the only Barrow ABC fighter to taste success, with junior Mason Strickland getting up off the canvas to earn a majority verdict against Fit 2 XL’s Aaron Eagen. This contest proved to be a proper tear-up, with the youngsters going at each other relentlessly for three rounds. Eagen showed a bit more style and poise, while Strickland was all about guts, determination and some big right-handers. It did not look good for Strickland when he was floored at the start of the third round. But he fought back well and produced a couple of great shots which rocked Eagen and edged the fight in his favour as he took a majority verdict. One of the main purposes of this event was to raise funds for the family of 10-year-old Barrow youngster Gerard McMeekin, who has had undergone a bone cancer operation recently and needs to make regular trips to Birmingham for hospital check-ups. And there was no bigger cheer than when Gerard’s elder brother Levi entered the ring to challenge for the North West regional 57-60kg title against champion Jordan Battle, of Blackrod. Right from the first bell the pair produced a thrilling spectacle, as they traded blow for blow. South paw McMeekin had the champ in trouble on the ropes in the second round, but Battle regained his composure and came back strongly. The pace was unrelenting for three rounds, and although McMeekin showed bottle and gave it everything he had, Battle had done enough to get the nod from the judges. Good news for the McMeekin family came with the fact that a mid-session raffle and auction raised a significant amount of money to help Gerard, featuring signed memorabilia from ring legends Floyd Mayweather, Sugar Ray Leonard, Joe Frazier and Muhammad Ali, which fetched hundreds of pounds each. The evening’s action began with skills bouts featuring several junior novices. Barrow ABC junior Ethan Greer showed a lot of promise and threw some nice combinations in his contest with Ryan Neill, of Carlisle Villa, while Josh Gardner looked solid in defence and grew in confidence as the fight wore on against Sandygate’s Dan Lord. Brook Street youngster Ellis Burns put up a valiant display in his junior bout against Wigton’s Robbie Pattinson, but was always up against it due to his opponent’s extra height and reach. Despite losing to a unanimous decision, Burns will have gained some valuable experience and certainly did not let anyone down. While Eilbeck stole the show in the senior ranks, there were three more local lads testing their skills in the ring. Not discouraged, O’Reilly kept at it and threw plenty of punches, but he didn’t connect regularly enough and was forced to take a standing count in the third and final round as he lost a unanimous decision. The last two bouts saw two rookies best associated with other sports enter the ring – Hindpool Tigers rugby league player Paul Rickleton and Vickerstown footballer Jordan Dix. Rickleton made a promising start against Joe Birkett, showing good technique and watertight defence in the first round, before the Kirkham ABC man began to dominate in the second. After taking one standing count, Rickleton tried in vain to get back into the contest, but when he was caught on the ropes again, experienced referee Heywood stepped in to stop further punishment. And last on the bill, debutant Dix should also be pleased with his efforts. 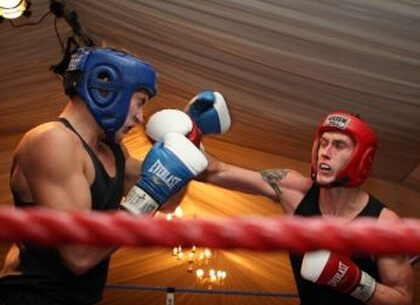 He began in determined fashion against Wigton’s Ben Hale in a bout which developed into a real brawl. Backed by raucous support, Dix stalked his opponent and swung wildly in the hope of landing a knockout blow. Unfortunately, his frantic pursuit saw him caught by some good counter-attacks and two standing counts in the final round put paid to his hopes of a victory as Hale took a unanimous verdict. Event organiser and Barrow ABC head coach Jeff Moses and fellow Brook Street members had put on a very entertaining show for the packed audience, and they were grateful to the event sponsors and to special guest, ex-professional boxer Kieran Farrell. The former central area lightweight champion presented the prizes to all competing boxers, while handing out some useful tips along the way and signing autographs for young fans.